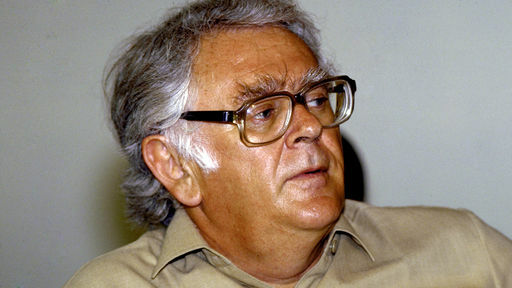 Benignly blinking through thick-lensed spectacles [Joe Slovo], this grey-haired Communist veteran, folded his hands across his ample waist and listened, occasionally shutting his eyes against the TV lights' glare -- the lids closing upwards like the eyes of a benevolent toad. I DRIVE over to the engineer in Langley and give him a £250 cash advance on the engine repair to our van. The "Pigmobile" (Jessica's name for it) looks very sorry, but not as sorry as the engineer. He is having difficulty getting the right replacement engine, he says. One piston rod has actually poked a hole out of the engine casing, which is why it screeched to a halt. "Use a rag next time," he lectures me, showing me the filthy oil pump he has disembowelled from the Peugeot's entrails, "not paper kitchen towel." I should not have driven on when it started clattering, he adds. Right, I won't next time. 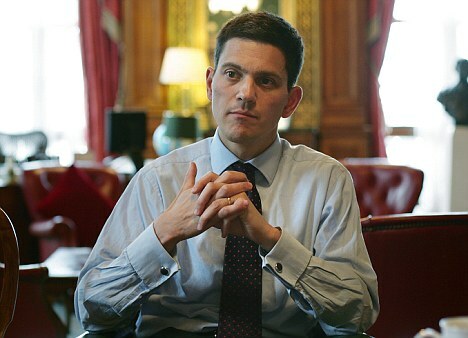 I SEE that David Milliband, our schoolboy foreign secretary, has got into hot water by equivocating, in an interview broadcast by the BBC, on terrorism. Like Orwell's Napoleon the Pig who defined in Animal Farm that two legs was bad, four legs good, Milliband has decided that terrorism is permissible if it is directed against law abiding White governments, like the government that guided South Africa to prosperity in its pre-Mandela years. That is a dangerous precept. Milliband (above) was born in Brussels of Polish-Jewish émigré parents. His father, the Marxist dialectician Adolf Milliband, had fled the Jewish ghetto in Warsaw; his grandfather Schmuel Milliband had fought for the Red Army; this rootless family had fled again, this time from Belgium, as Adolf Hitler's army moved into the country in 1940; and the Milliband ménage managed to catch a boat to England, entering the country as illegal immigrants. As Adolf was not a popular name in England, his father changed it to Ralph. Yes, but Milliband? Thus not even a Nanoband had to face the dilemma which faced the Polish resistance against the Nazis; terror, or no terror? These resistance fighters, called terrorists by the Germans, would nowadays be called insurgents by the Coalition of the Good, and were presumably anyway okay by David Milliband. They were terrorists nonetheless. Allied (CCS) documents show that they decided it was a jolly good idea to spread typhus bacteria against the German soldiers; they failed to appreciate, in their less than infinite wisdom, that bacteria are blind -- they are poor respecters of race or uniform, let alone religion, and indeed kill all indiscriminately: the wartime typhus epidemic rampaged out of control across eastern Europe thereafter and many a Jew did not live to tell the tale. In the BBC interview Foreign Secretary Milliband was moist-eyed about his own brief encounter with a terrorist leader, the notorious and thoroughly nasty Lithuanian Jew Joe Slovo, who directed terror operations against the White and Black South Africans throughout the 1980s. Slovo called unannounced one evening at the Millband refugee household in London for a chat with Adolf, sorry, Ralph, and young David opened the door to him. JOE SLOVO (above) was born in that same fertile corner of Lithuania which spawned other violent Jews, including Menachem Begin, or was it another of that ilk? I last saw Slovo on the stage at the Conway Hall in Central London nearly a quarter-century ago. I afterwards wrote an article for the press -- which none printed, so far as I recall, decribing: "Benignly blinking through thick-lensed spectacles, this grey haired Communist veteran folded his hands across his ample waist and listened to Nzo's speech, mouthing the words and occasionally shutting his eyes against the TV lights' glare -- the lids closing upwards like the eyes of a benevolent toad." Even that mild sentence got me into trouble years later, although I had made no reference to Slovo's origins. "A viciously anti-Semitic description," one Canadian broadcaster rebuked me, without really thinking what he was saying: because he was stereotyping, not I. Two years before the meeting, in 1984, Mr Slovo had been appointed to lead Umkhonto we Sizwe (Spear of the Nation), the armed military wing of the ANC, which had been formed in alliance with the South African Communist Party (SACP). Visiting Johannesburg in 1987 I unexpectedly obtained gruesome authentic film footage showing the Slovo terrorists at work. In the evening J [a South African diplomat] arrived to collect American "lobby specialist" D DeK. to spend the evening viewing two SAP [South African Police] videos at the home of A., about ten kilometres from here; her three or four yappy dogs bothered us all evening. Good supper, although appetite had suffered from the actual content of the videos: watched one, rubber stamped VIDEO EINHEID SOWETO, and numbered 18 (the other was 5). The video lasted 90 minutes; it was a rough compilation of South African police videos, confiscated commercial TV reporters' video footage, etc., and included the most gruesome scenes I have ever witnessed: the very unedited nature of the footage added authenticity. There were police shots of mass UDF [a Leftwing Liberal Black Party] demonstrations, the marshals being visible in their yellow T-shirts; the mobs jogging, dancing, ululating, whirling all the time, swirling past impassive police troops and soldiers, standing with arms akimbo, motionless although outnumbered perhaps 100 to 1; then a small group chases a Black, catches him, [filmed] in close up -- perhaps ten feet from the camera -- beats him to the ground, hacks him apart and stabs him with a dagger until he is dead. A Black woman is necklaced [with barbed wire and a rubber tyre soaked in diesel fuel], her back to us, kneeling on the ground; she sways, the Blacks kick her, her arms are pinioned behind her with barbed wire; as she reels under the kicks she tries to pull her skirt down at the back with one pinioned hand. [... She is then brutally killed]. The video is terrifying to watch, particularly the blood lust of the frenzied Black mobs, chanting Zulu war songs, calling the name of Oliver Tambo; there is video footage of Winnie Mandela, eyes glazed (she is an alcoholic), speaking to a mass audience, proclaiming, "With our necklaces we shall liberate!" or words to that effect. This and the other SAP video are from the classified video library of the authorities here. They have the feeling that it would not be conducive to S.A. 's good to show them in public (South African television has never shown scenes of anything like such violence or intimidation.) It is very worrying, and I am convinced that Pretoria is wrong: the footage must be shown, if I can persuade Jae to make it available. A long argument develops, she is very reluctant indeed, having been loaned the material in her official capacity to show to Military Intelligence, not to D. and myself. ... I go to bed around midnight, fearful of nightmares. Like Mandela, Slovo made no distinction as to colour; which meant that most of his victims were Blacks. Terrorism has always had its unwholesome supporters. Another was our own well-respected (now ex-) minister Peter Hain, who was photographed weeping at the graveside of a South African terrorist whose bomb had killed or maimed little girls and other innocents in Pretoria's railroad station. That photo was taken years before Hain came to prominence for reasons both valid and false -- like the absurd, totally absurd, allegation that he had been positively identified robbing a bank in Putney High Street, which was probably his lowest point. As said, unthinkable and totally absurd. Even I, at my most impoverished, have never stooped to robbing banks: on the contrary, it is they who systematically rob us. Somebody comments to me: Throughout the BBC interview, no doubt in polite deference to Milliband's family origins, two terrorist organisations were NOT cited - the Irgun Zvei Leumi, and the Stern Gang. So no surprises there. There's a blue commemorative plaque on the outside of Joe Slovo's former home, a run-down house on a busy street in Campden. It is only about five minutes' walk from another Blue Plaque-adorned house, dedicated to the writer George Orwell. I wonder if their ghosts ever meet and clash beyond the mildewed skirtings of this strange city, London. Spreading the word about ANC terror campaign: David Irving, Press Release, Nov 23, 1987: AUTHOR SMUGGLES POLICE TERROR FILM OUT OF AFRICA "....returned from South Africa this morning Monday with sharp criticism of Sir Richard Attenborough's film "Cry Freedom," and more: gruesome secret film footage shot (or confiscated) by the South African police and army during counter-insurgency operations in the cities and Black townships last year." The Polish bacteria weapon: see David Irving: Hitler's War, Germany 1939-45, ch 26: "the four-room house harbored not only the usual quantities of explosives and detonators, but also "three flasks of typhus bacilli, seventeen sealed rubber tubes presumably containing bacteria , and one fountain pen with instructions for use for spreading bacteria"; captured documents revealed that twenty pounds of arsenic had also passed through the house.